‘Paul Beckwith is one of the leading experts in abrupt climate change. In the first part of this interview we have been talking about the fast changes in the Arctic that lead to climate chaos and even to changes of ocean currents. Part 2 is about weather extremes in Western Europe, BIG numbers, global emergency and dealing with this dire situation emotionally‘. 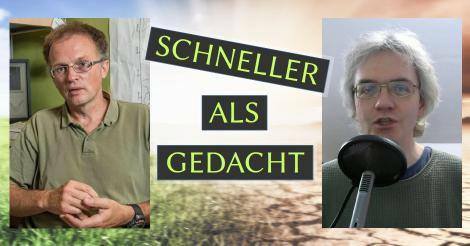 If any of you have not–as yet–taken time to listen to Schneller Als Gedacht (SAG 007, second link above), it is very, very strongly recommended that you do so. Its creator is a high bandwidth thinker, at once capable of understanding areas as disparate as science, economics, systems theory, humanity, children, soul, and compassion. We all greatly look forward to more of Wolfgang’s solid and wide roster of guests, and his dependably moreover adding balance to the preponderance of rapid climate change thinkers and ample friends and colleagues stemming from The States and other English speaking countries including Canada, The United Kingdom, Australia, and New Zealand. This entry was posted in Podcasts and tagged Abrupt Climate Change, Direct Capture--Remove CO2, Flooding in Europe, Greenhouse Gases, Jetstreams, Podcasts, Torrential Rains, Wolfgang Werminghausen, z Faster Than Expected, z Gulfstream, z Marine Cloud Brightening, z Replanting Programs, z Schneller Als Gedacht. Bookmark the permalink. Thank you for your interview by Mike Ferrigan. I included it, lightly edited for brevity and sound quality, on the 24 June edition of Sequitur on Expressions of Peace Radio, archived at PANinA.org: https://panina.org/2016/06/23/doom-without-gloom/.